Description: This is our Indian children's tent, which is perfect to create a fun play area for your kids. The use of natural wood production,hand sanding and smooth surface, protect your child's hands from any harm. With tons of room inside for your little one and their friends, your child will want to spend hours inside this cool tent! 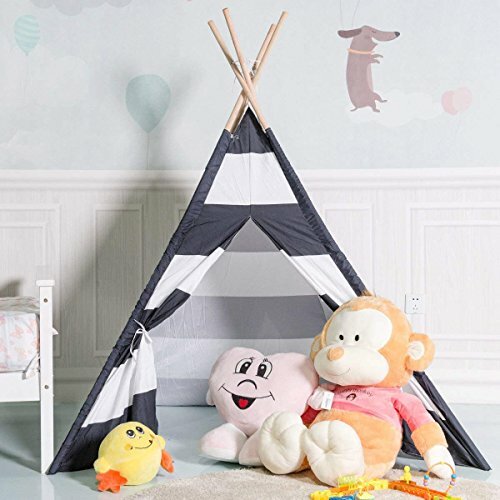 Perfect for sleepovers or even just daytime activities like coloring and reading, your child will have tons of fun stimulating their imagination inside this tent. Each one of the four long poles can be dismantled into two shorter poles. ✿ Safe& Comfortable - Costzon teepee tent is made by 100% natural, breathable and unpainted cotton canvas which features great breathability with softness. Constructed by sturdy pine wood which is free of chemical odors or harmful substances, it is durable and stable for your children to spare their leisure time. ✿ Sweet Bandage - Open the "door" conveniently with the bandage design to enlarge their playing area. It is also easy for your children to close the "door" with velcro while they want to have a privacy space alone. ✿ Foldable& Portable - It is lightweight and easy to set up. There are eight poles in total which can be connected by 4 plastic pipes for easy folding and unfolding. This teepee comes with a canvas bag so that you can store the teepee to save space. If you want to take it to a friend's house, takedown is a breeze, simply untie the poles and unthread the wood from the fabric holes to store. ✿ Great Children's Gift - This adorable Teepee is a PERFECT Present for your children's birthday, Christmas. It will work great on their sleepover party, for playroom decoration, etc. They will love to have their private space and become more independent. ✿ WORRY FREE PURCHASE- We at Costzon stand behind our products with our Satisfaction Guarantee. We not only offer qualified products with favorable price to our customers, but also great customer service. View More In Play Tents & Tunnels. Fairy Lights for Teepee Tents - Battery Operated. Set of 75 Bright Yellow LED Bulbs. Easy Installation, Universal Design - Our Decoration Light Set Fits Most Kids Playhouses. TENT NOT INCLUDED.